A Brooklyn Winery Wedding Photographer is in for a real treat at this exceptional venue. The Brooklyn Winery is a unique space that makes any couple’s wedding day something truly special. From the moments shared between the couple and their guests, to the interior of the winery, a Brooklyn Winery Wedding Photographer has a multitude of options for great wedding pictures. The Brooklyn Winery was opened by co-founders, Brian Leventhal and John Stires, who had previously worked together at an internet startup. While there, they began to make their own wine with a group of coworkers at a winemaking facility in New Jersey. They soon moved the venture to Brooklyn and dove into the business full-time. The winery contains beautiful barn wood walls, a zinc-topped wine bar, vintage 1940’s wallpaper, midcentury fixtures, and many other one-of-a-kind details throughout the space. A Brooklyn Winery wedding is singular experience that allows guests to mingle amongst wine barrel cocktail tables and stainless steel wine fermentation tanks. 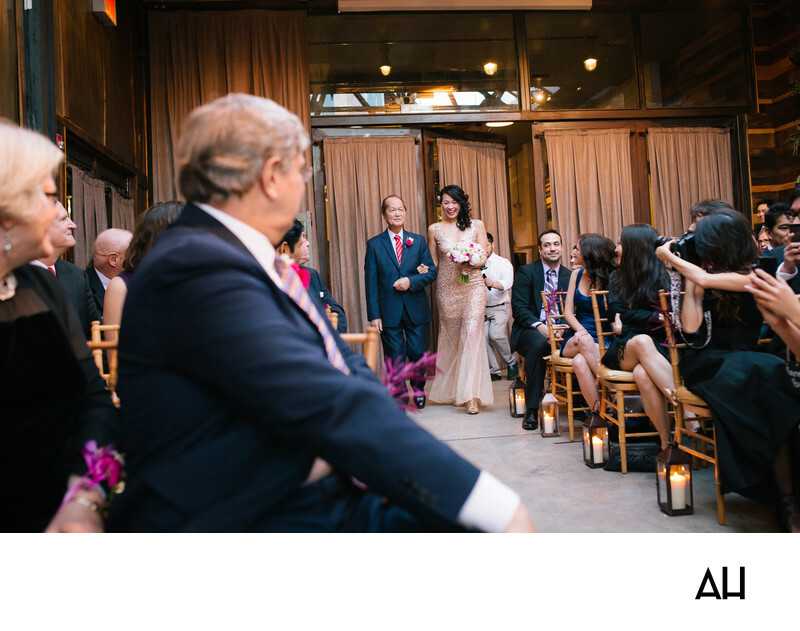 This image from a Brooklyn Winery ceremony shows off some of the details of the venue’s interior, but the main focus of the picture is the bride and her father. The photograph was taken at the start of the marriage ceremony, with the bride taking the first steps of her walk down the aisle. The bride wears a gorgeous, non-traditional wedding gown. The dress shimmers as she walks, with blushing beige colored fabric that is covered in sequins. The bride radiates from every angle, as she take the arm of her father and they walk towards her husband-to-be.